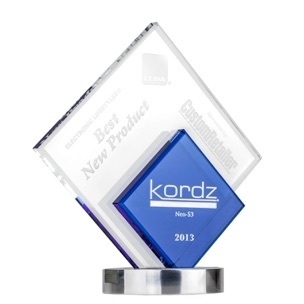 Kordz NEO-S3™, powered by phaseHD™ of Canada, rethinks long length HDMI connectivity. 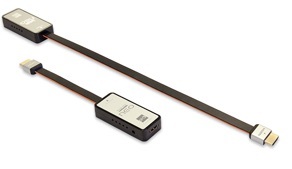 Comprised of two compact dongles - a transmit and a receive unit - NEO simply connects to both ends of an existing (to 20m) or new (to 30m) long length passive HDMI cable, actively upgrading it to High Speed 4K UltraHD compatible. What makes it unique and immensely powerful is the fact that it’s double-ended, encapsulating the long HDMI cable, isolating it both electrically and mechanically from the endpoint devices. That means that NEO can control every aspect of the HDMI signaling from tip to tip, including DC power, low speed and high speed signaling. •Interoperability. Fully managed power and buffered DDC means vastly improved interoperability, regardless of resolution. That is, it even makes 1080p work better. 3.Finally, connect external power (included) to the Tx dongle. There’s no further setup or tuning required. NEO auto-adapts to the long reach link cable and does the rest automatically, upgrading the HDMI cable to 4K UltraHD capable. 4K UltraHD (24fps) requires double the data rate of 1080p60 Full-HD. By adding NEO to both ends of a new or pre-existing 1080p/60 supported HDMI cable, performance will be upgraded to reliably support 4K UltraHD. When making a connection from HDMI (source) to HDMI (sink), we believe that it’s logically best to keep it HDMI all the way. Converting to something other than native HDMI in between does introduce an extra layer of complexity and interoperability risk. Long length HDMI cables are typically thicker, heavier, harder to install, have long mounting depths which are prone to connector dropouts, and are performance limited to 1080p/60. NEO-S3 is so powerful it can double the data rate to 4K capable, while at the same time double the length potential and make the cables thinner. In fact, a mere 30AWG to 20m lengths, increasing to a still modest 26AWG to 30m. The bespoke engineered pigtail cables which connect to the endpoint devices are so tiny and light weight as to reduce mounting depth to a mere 25mm / 1″. When combined with the die cast connector which exhibits double the retention force of the average HDMI connector, HDMI plug dropouts become a thing of the past. No locking required. ‘Active’ means it needs power. APM ensures delivery of the precise level of DC required for each and every part of the system. Some active HDMI cable solutions use alternative methods of power delivery, but this means relying on 3rd party devices to deliver the requisite power; that can’t always be relied upon with any degree of consistency. NEO instead takes full responsibility by having its own external power source, located at the source end only, for installation convenience. The DDC within HDMI is rarely spoken of, but is in fact the #1 cause of interoperability failures of HDMI installations in the field. By fully buffering the DDC at both ends of the long HDMI cable, ensuring reference signaling, NEO vastly improves handshake stability regardless of resolution. That is, with NEO-S3 in use, even 1080p/60 works better. As NEO can be adapted to pre-existing installed HDMI cables, there’s not necessarily any need to pull out the old cable and replace it with a new one to obtain 4K UltraHD performance. For every upgrade install that’s one less new cable to make and ship around the world, and one less old cable to pull out and deliver to landfill. phaseHD and NEO alleviates HDMI cable redundancy. The PCB assembly at the heart of NEO-S3 was fully engineered and built in Canada as a consortium project of phaseHD and Kordz, employing phaseHD’s proprietary chipset with discrete channel auto-adaptive equalisation technology. High level performance with build quality that’s second to none.